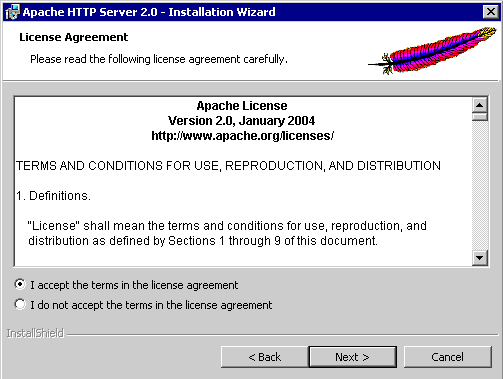 Many people shake their head in disbelief at the Internet server Apache under Windows, however I consider it more suitable for application development than Windows Internet servers IIS or PWS. We have already published some articles about IIS and its configuration. 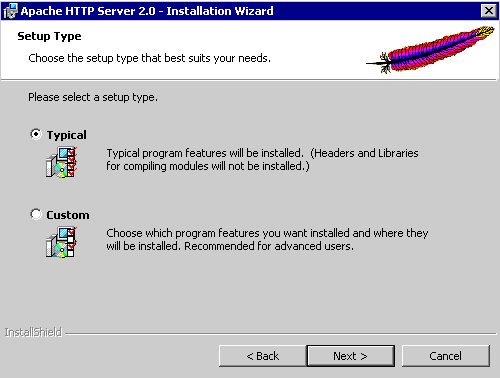 This article follows the article about installing MySQL and focuses on installation and configuration of Apache 2 and PHP (version 4 and 5) for Windows XP. 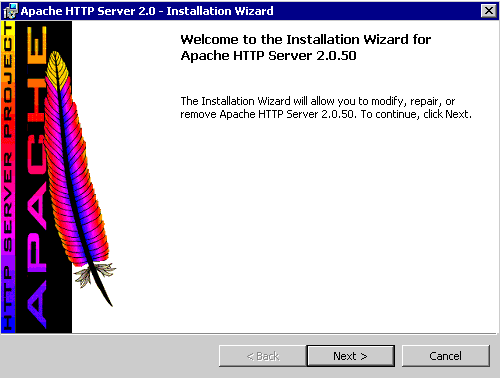 Apache Server (httpd.apache.org) - Win32 Binary (MSI Installer): apache_2.0.50-win32-x86-no_ssl.msi, apache_2.0.50-win32-x86-no_ssl.exe. (download files and details to installation on Windows you will find here: www.apache.org/dist/httpd/binaries/win32/). Notes for Windows9x - *.msi pack cannot be used if Microsoft Windows Installer has not been installed. This year Microsoft closes the Win9x support and it is the reason why the support of newer versions of PHP, Apache, Mysql is limited or does not exist anymore. This article does not mention dissimilarities from the installation on Windows9x. The first step after starting is to click the Next button and agree with the license. Fill in the configuration data (example): 1. Domain (home.net) 2. 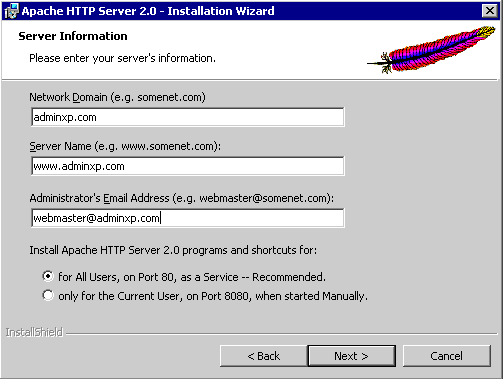 Server with domain (server2.home.net) 3. Administrator's address (webmaster@home.net) 4. Define if for web or for user (differs in setting the port and in automatical or manual start). For testing and for local computer, it is recommended that you keep the default pre-sets, except the e-mail address, of course. Typical - includes standard components. Or you can choose the Custom - you can choose components. Define the destination folder. Default is "C:\Program Files\Apache Group\". In our example, we changed the path to "H:\apache\". Buttons Next and Install follow. If you are running some programs at the moment, you will be advised to close them. Than you should be informed that the installation was successful and the computer should restart (not necessary under Windows XP). Icon in the right bottom corner - displays the contol panel of the service or starts the Apache Monitor. Under Windows 9x, the icon seems to be useless. Services - Standard setup of the Apache server as a service. Automatic or manual start. Apache Monitor - Setting and starting the Apache service on the local or remote computer. Configuration - 1. Editing of the configuration file (httpd.conf). 2. Checking the syntax and the configuration file (H:\apache\Apache2\bin\Apache.exe -w -t -f "H:\apache\Apache2\conf\httpd.conf" -d "H:\apache\Apache2\."). Control - 1. 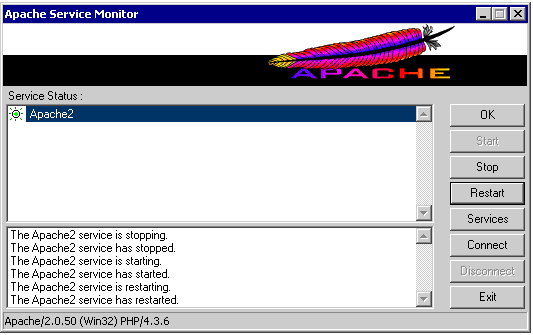 Starting the Apache Monitor application (in default, it runs automatically after Windows start), 2. Starting, 3. Stopping, 4. Server restart. Files with records - Links to files with records about access and errors. Documentation - Links to manuals and other files containing information about setting, problems and tips relating to the Apache server. The basic configuration file with all settings for Apache. It can be found in this directory: Apache\Apache\Conf\. To edit it, use the Notepad or another text editor. There exist special editors for programmers that highlight the configuration records and so distinguish them from the notes. Each line is a configuration entry. Lines beginning with the character # are exceptions, they denote notes, comments or deactivated values or their examples. If for any reason you do not want to run Apache as a service, you can run the server as a standalone program (manual start in the Console mode). You can do it using the command line, a shortcut, the Explorer or another file manager by opening the apache.exe program (in our example H:\apache\Apache2\bin\Apache.exe). A DOS window will open. To end the console, press Ctrl+C. Example of an error message - [Sat May 22 11:04:45 2004] [error] (OS 10045)Operation not supported on socket: Child -185581: Encountered too many errors accepting client connections. Possible causes: Unknown. Try using the Win32DisableAcceptEx directive. Win32DisableAcceptEx - For Windows. This is useful when errors occur that are related to misfunction of WinSock 2 APIs, usually as a result of using third party products as antivirus programs, VPN or firewall. In case there are AcceptEx error messages in the error log, it is necessary to add the item Win32DisableAcceptEx to the configuration file (no matter where, I put it to the first section called Global under ServerRoot). More info here Apache. Unzip the file with PHP files to a directory (usually C:\php). Copy the php.ini-recommended file (or php.ini-dist) to %Systemroot% (Windows or Winnt) and change the name to php.ini. Copy the php4ts.dll (php5ts.dll) file to the Windows directory containing the *.dll libraries (under Windows XP/2003, it is %systemroot%\system32). For easier debugging, I enable reporting of error messages in the explorer using the php.ini configuration file php.ini and the display_errors = On line (It is recommended that you replace the line error_reporting = E_ALL with error_reporting = E_ALL & ~E_NOTICE, this will disable the warnings of some less important errors such as non-initialized variables). The MySQL support is not enabled as default. You will enable it by removing the semicolon in the line ;extension=php_mysql.dll and copying the libmySQL.dll file to the directory %systemroot%\system32 (directory to which the php5ts.dll file was copied). If this file is missing, an error message "Unable to load dynamic library 'c:\php\php_mysql.dll'" will appear. Put the name of the computer or the server IP address to the explorer. (In case it is the same computer - http://localhost/ or http://127.0.0.1/). File for testing functionality of Apache and PHP. 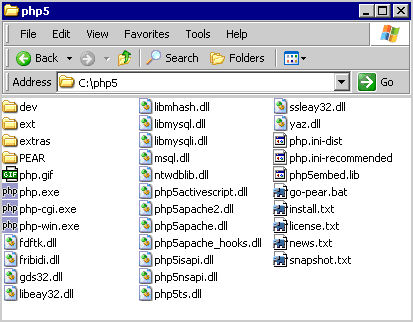 It displays a table with configurations data about PHP. After having created the file, you have to upload it to the server and to enter the path to the server and to the file in the explorer (In case it is the same computer - http://localhost/test1.php or http://127.0.0.1/test1.php). After having created the file, you have to upload it to the server and to enter the path to the server and to the file in the explorer. (In case it is the same computer - http://localhost/test2.php or http://127.0.0.1/test2.php). Values between double quotation marks for $user and $password ($host) may need to be replaced with correct values (name and password entered upon the first start of winmysqladmin.exe). In default, you can enter any user and an empty password (delete value text pass) and the script will work.